Morgan Fowler stared out of the van’s window, watching the lush Philippine rainforest pass by on the winding mountain road. It had been raining, not the heavy downpour of the day before, but still enough to drench the trees and lush shrubs, causing the vibrant green hues to sparkle in the afternoon sun. He smiled as his mind wandered to the many activities he had participated in during his 10 days in the Philippines to attend the SULADS International fiftieth anniversary celebrations. SULADS International is a community-based nongovernmental organization (NGO) involved in development projects for native tribes in remote areas where they may not have access to education and health care. The work of SULADS began in 1969 among the Manobo tribe of Mindanao in the Philippines. The word sulad is the Manobo word for brother or sister. SULADS is also an acronym for Socio-economic Uplift, Literacy, Anthropological, and Developmental Services. Through the years, SULADS has provided informal education and agriculture and health programs designed to alleviate illiteracy, poverty, and disease, while also promoting social awareness and giving due respect to local traditions, beliefs, customs, aspirations, and interests. SULADS (in all caps) refers to the organization and the work. “Sulads” refers to the volunteers serving in these otherwise unreached territories. For the Philippine trip, Morgan Fowler, 16, and his 20-year-old brother Allen traveled deep into the island of Mindanao, where Mountain View College is located. 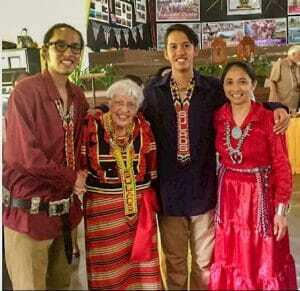 Ten junior sulads were accompanied by SULADS USA president Asher Himbing, along with Marjorie Ladion and 91-year-old SULADS pioneer Jean Zachary. More than 400 sulads from around the world convened at Mountain View College June 24 to July 1, 2018, for the week-long celebration. Southern Asia-Pacific Division (SSD) president Samuel Saw and VicLouis Arreola III, director for Asian/Pacific Ministries for both the Pacific Union Conference (PUC) and the North American Division (NAD), were among the attendees. The activities included a parade of tribes; a medical-dental mission (free clinic) in tribal lands; presentation of reports on SULADS work around the world; cultural presentations by several tribes; and a SULADS fair and recruitment event. The anniversary event also offered plenary sessions focusing on revival; a communion service; a concert by sulads children; and visits to nearby SULADS mission schools and a SULADS orphanage. As he was leaving, Fowler remembered all he had done during his 10 days in the Philippines. He had spoken at a rural church, met people from many native tribes, talked with tribal leaders, played basketball with fellow sulads, heard reports of the SULADS work around the world, visited a SULADS orphanage, swum underneath a large waterfall, eaten tropical fruits, and prayed with new friends. Fowler sighed as he realized his visit to the Philippines was coming to a close. Would he ever get to visit the Philippines again? Would he see his new friends again? How would he relate to his tribe back home all that he had learned while at the SULADS anniversary event? His thoughts drifted to home, in the desert of Arizona, United States, on the Navajo Nation reservation. Morgan and his brother Allen are Native Americans. As the older sons of a Navajo chief, both are performing youth leadership roles in their communities. Morgan and his brother Allen are some of Arizona’s top athletes for their age group. Their goal is to one day be in the track and field team representing the United States in the Olympic Games. For two weeks in the summer of 2018, both took time off from their training to visit the Philippines and participate in the SULADS 50th Anniversary Reunion. They were able to observe sulads on the sulads’ home turf and to see the long-term results of sulads’ presence in a tribe. Morgan and Allen’s parents were the first in their community to encounter SULADS International and invite sulads to work among the Native American people in the United States. They attended an Adventist Laymen’s Services and Industries (ASI) convention and met Canadian pastor Charles Ed Aguilar. Their conversation touched on the problems faced by Native Americans on reservations. Aguilar acknowledged that the same problems are present among the Native American tribes in Canada. He disclosed that in the Canadian communities with SULADS presence, the Canadian government has seen a significant change for the better. For example, youth who were previously delinquent in school were now excelling in their grades, enjoying improved interpersonal relationships with members of the community, and some were actively leading in community projects. Alcoholism, substance abuse, domestic violence, and high rates of suicide had also significantly decreased. The members of the tribe seemed happier. Intrigued, the Fowler family visited Canada to see this phenomenon for themselves. After meeting the Native Americans in Kitwanga, British Columbia, the Fowlers decided they needed sulads. They asked for sulads to be sent to the Navajos. But who would come? The nearest sulads were in California and were senior citizens. Who would answer the call? The call was answered by the unlikeliest group, some Southern California Adventist teens between the ages of 10 and 17. Because of their ages, they could only visit the Navajo Nation during summer and Christmas breaks. Referred to as junior sulads, these God-sent teens are the front-line sulads for SULADS USA. For two years they have led the SULADS work in Navajo lands while utilizing their parents and adult friends as designated drivers, cooks, and chaperones.